Cuban Diplomats Expelled After U.S. Embassy Staff 'Incidents' In Havana : The Two-Way The State Department says several U.S. State Department officials in Cuba have developed strange medical symptoms. Reports suggest they may have been caused by a covert sonic weapon. State Department spokeswoman Heather Nauert speaks during a briefing at the State Department in Washington, on Wednesday. The U.S. State Department says it expelled two Cuban diplomats earlier this year after several Americans at the U.S. Embassy in Havana experienced strange medical symptoms and were either recalled to the U.S. or allowed to come home. State Department spokeswoman Heather Nauert said the "incidents" were first discovered in late 2016, but she declined to provide any details. "We don't have any definitive information about the source or the cause," she said. "It took time to figure out what this was and we are still looking into it." However, The Washington Post reports that U.S. officials believe Cuba used "a covert sonic weapon that left the victims with severe hearing loss." "In the fall of 2016, a series of U.S. diplomats began suffering unexplained losses of hearing, according to officials with knowledge of the investigation into the case. Several of the diplomats were recent arrivals at the embassy, which reopened in 2015 as part of former President Barack Obama's reestablishment of diplomatic relations with Cuba. Some of the diplomats' symptoms were so severe that they were forced to cancel their tours early and return to the United States, officials said. After months of investigation, U.S. officials concluded that the diplomats had been attacked with an advanced sonic weapon that operated outside the range of audible sound and had been deployed either inside or outside their residences." 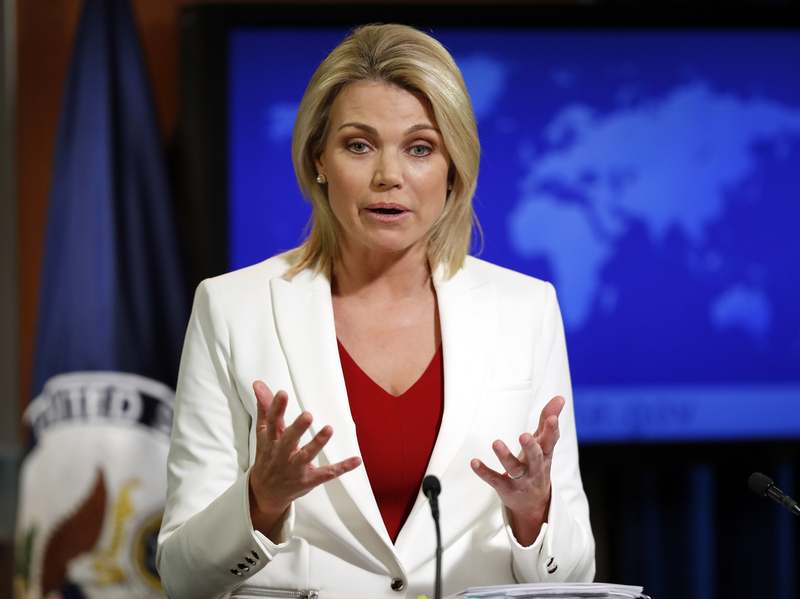 Nauert said that the two Cuban diplomats were "asked to leave" in May, but she declined to characterize their departure as reciprocity for the incidents. Cuba responded by saying that it would never allow its soil to be used for actions against diplomats and that it is willing to cooperate with the U.S. to clarify the incidents. It also called the decision to expel Cuban diplomats "unjustified and baseless." Sen. Marco Rubio, R-Fla., a staunch critic of former President Obama's decision to reopen relations with Cuba after decades of Cold War isolation, said in a statement: "The Cuban government has been harassing U.S. personnel working in Havana for decades. This has not stopped with President Obama's appeasement. Personal harm to U.S. officials shows the extent the Castro regime will go and clearly violates international norms." A previous version of this story contained an incomplete quote from Sen. Marco Rubio, R-Fla., about "U.S. personnel working in Havana for decades." Rubio's complete quote has been restored.